Such are the basic facts. 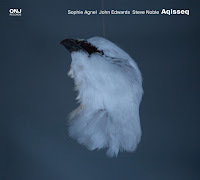 Much has been written about the period, the innovative work of Stevens and SME, and this album, so we now move into areas where opinions differ, and this being free improvisation, there is often heated debate, and some grumpiness. Karyōbin is regarded by many as a pioneering album. When considering it later, Derek Bailey spoke with disdain about an obsession with dates – what came first – and sinking to the level of the antiques trade, but you don’t have to be an antiques dealer to take an interest in the past and what it produced. There is the danger of mythologizing, and giving things undue prominence (being the first doesn’t make it the best) and there must have been many other performances at the time which would warrant equal attention had they been recorded, but they were not. Unlike Bailey, for those who were not there, all we have is this album and a handful of others. Karyōbin is not merely a fortuitous curio however, and it retains the freshness and vitality that these and other musicians felt in exploring new territory outside their previous comfort zones. As Holland says: “This recording captures the spirit we shared of spontaneously discovering the music”. SME was reduced to just two members, Parker and Stevens, when at the instigation of Kramer, Chris Blackwell of Island Records invited them to record, and they asked Wheeler, Bailey and Holland to join them. They had all performed with each other at the Little Theatre Club, but never in this combination, and due to the vicissitudes of musical life the grouping was never to play again. They got together at the Club a few days after the session, but only for the photograph which appeared on the back cover (see below). Both Stevens and Bailey had also been fascinated by the music of the composer Anton Webern – Bailey had listened almost daily in his Fulham bedsit to a reel to reel tape he had made of Robert Craft’s recordings of the complete music of Webern, often at high volume and to the annoyance of his landlady. In his liner notes, Davidson cites Webern’s Quartet, Op. 22 (1930) for violin, clarinet, tenor saxophone and piano as particularly important. Both Webern and SME’s music has been described as “pointillist”, and although there’s some truth in that, it’s also a little misleading and misses something important. It’s not about atomisation: breaking material into fragments, but using tiny parts to create a greater whole. In the case of Webern’s Quartet, the texture is woven out of melodic particles – apparently trivial two and three note motifs, rising and falling -- which are dovetailed into a complex of ever shifting combinations. Parker has described a similar process in SME as “interconnected coexistence”, and it’s primarily this which gives the ensemble’s music its distinctive sonic colour, even though the language is very different from Webern. What we hear is a kaleidoscope in constant motion – said by the jazz critic Duncan Heining, to be “quite one of the most lovely pieces of atonal music in any style” – having an almost quaint charm, a sense of playfulness (not frivolity) that belies some of the more grandiose pretensions heaped on it. There’s also an elusiveness to the music, captivating or frustrating depending on taste, as each musician is trying to respond to what others are doing, as distinct from what they themselves are playing, forming a sort of multiple feedback loop, criss-crossing the ensemble. 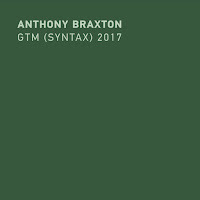 Response is also dependent on resource, so that within this patchwork individual character remains intact, as heard in Bailey’s squeezed notes and metallic edges, the curlicue inversions and micro gradations of Parker’s saxophone, and Wheeler’s lithe, bright swoops. Referencing what others are doing can take many forms. Some of the playing is imitative: small cells bounced around the instruments. Much of the time, it has more to do with affinities and contrasts in movement, shape and register than the actual notes played – brittle guitar against reverberant plucked bass, Wheeler’s modulations in tone circling the saxophone’s splintered line. Stevens uses his own custom-built kit, designed to sound at the same volume as other instruments. He’s light and frisky, with a supple touch, complimenting the fluid phrasing of his colleagues. On first hearing, Karyōbin sounds like a continuous piece of music, and on the original LP it was simply split over two sides. In fact, the master tapes are divided into sections suggesting that the final version was compiled from separate takes. The parts are banded on this and the previous CD edition. They shift between intimate and chatty, and each starts slightly differently, from the collective spasms which give birth to Part 1 to the more confident flurries that open Part 6. There is the potential problem that a multiplicity of threads can result in a uniform texture. To thin the weave, and provide greater variety, from time to time players drop out for a period and re-enter. These can be relatively brief, leaving little duos and trios, or more lengthy, such as when saxophone and bowed bass play reciprocal overtones in Part 6. The album’s full title is “Karyōbin are the imaginary birds said to live in paradise”, taken by Stevens from a track on an LP of Gagaku, Japanese court music. Not too much should be read into this; it’s a loose association evoking an alluring, alternative world, the kind of thing musicians use when they have to think of a name for something, and as Davidson remarks, it doesn’t sound like Gagaku, which is monophonic in nature. The soft gong in Parts 3 and 4 (a single take) could just as easily have come from a Gamelan orchestra: Stevens had a keen interest in the use of percussion in many genres. Karyōbin also shares the slightly exotic, crystalline timbre of blown, plucked and struck sounds heard in Pierre Boulez’ Le Marteau Sans Maître (1955) a work with which it’s been compared, though the compositional methods are diametrically opposed and is unlikely to have provided any direct inspiration. Some were critical of the 1993 reissue, feeling that greater instrumental separation had been achieved at the expense of ensemble sound. This edition’s mix is more even and smoother, less forensic but still allowing details to emerge, particularly Stevens’ airy percussion. 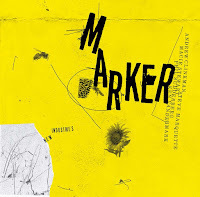 Like looking at Miró’s Constellations paintings or the mobiles of Alexander Calder, one of the pleasures of this music is attending to the assorted configurations and the relationships between local and global – subtle cognates and variants against the assemblage as a whole – something easier to grasp than articulate as within the bustle players move in and out of focus, sometimes rapidly, other times with an easy grace. To an extent, this is a matter of listening perspective and is aided by the mix, which gets the balance just right, illuminating both the dazzling surface and what lies beneath. 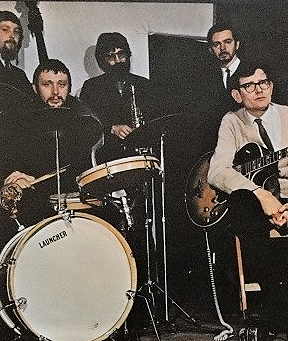 The musicians appear to have been satisfied with the album except for Bailey, possibly one of life’s contrarians, who told his biographer, Ben Watson, that he never really liked it. In terms of its impact, one shouldn’t underestimate the importance of major label distribution. 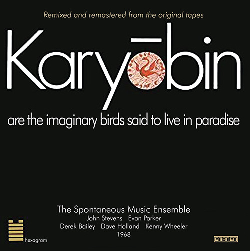 It meant that Karyōbin was more likely to appear in ordinary record stores, and record libraries (before the Internet, an important resource for the inquisitive) and although its sales were small in comparison to other albums on the Island label, in the long run this, along with the seductive sound-world, must have contributed to its exposure and higher profile – not that there was much competition, with few improv albums available at the time and most hard to come by. The LP was released on the Hexagram sub-label of Island, established to feature the music of Stevens, Parker and Bailey, but it never got beyond this single release. Island concentrated on better-selling artists – Jethro Tull, Traffic, Fairport Convention – and Kramer, who had been the principal engineer on Axis: Bold as Love by the Jimi Hendrix Experience, went to New York to work on Hendrix’s next album, Electric Ladyland, and stayed. Not long after the session, Holland got the call from Miles and also left for New York. When he played the album to Miles he was told: “Just don’t expect my band to sound like that”, more an observation than an opinion. In January 1971, the same musicians, with Trevor Watts on soprano saxophone rather than Parker, recorded So, What Do You Think? (Tangent, 1973) which is arguably, a more accomplished session in terms of the tight integration Stevens was after. Bailey found it the more satisfying musical experience. Davidson has turned down the opportunity to reissue the album as he finds the percussion to dominate both the music and the mix, not something I’d noticed. On listening again, the drums have a closer balance and are less crisp than on Karyōbin, but to my ears don’t sound obtrusive. Given Davidson’s efforts to chronicle SME’s music, his decision is surprising, but he’s clearly a man of principle and not prepared to release material about which he has serious reservations. Since the album was only available on vinyl, hopefully someone else will provide a CD reissue to at least give the listening public the chance to assess its merits. 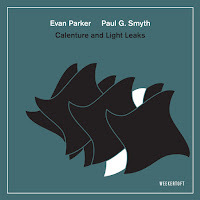 There’s also Quintessence (Emanem, 2007), which includes an 85-minute performance from London’s ICA Theatre from 1974 by the quintet of Stevens, Parker, Watts, Bailey and Kent Carter (cello, double bass), a more expansive affair. 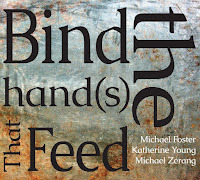 The CD has sold out and is awaiting reissue; a digital download is available from Subradar. Karyōbin, So, What Do You Think? and Quintessence sound rather different from other SME music, which is probably down to their especially rich instrumentation and the personnel. All three albums are highly respected though inevitably, they have their detractors. Quintessence has been described as one of the greatest examples of free improvisation. Bailey’s biographer takes a very different view, and Peter Brötzmann regarded this kind of playing generally, as symptomatic of what he called “the English disease”. Notwithstanding that Karyōbin is a snapshot from something much larger; it remains a valuable and bewitching example of improvisation where each part is integral to the overall effect. All told, an album that should be in every collection. thank you for such an absorbing, in depth and informative review. I've lived with, and loved, the Chronoscope for years but I'm intrigued to hear what Adam Skeaping makes of the music so will purchase this. Ive always found this one of the most accessible documents of that scene and I think is a very good example of what Stevens was hoping to achieve, as is "So, What Do You Think". I'd not thought of the comparison with the Boulez before but now you've mentioned it I realise I have a very similar response to both pieces. There's a clarity and "lightness" to both that allows the music to almost sparkle/shimmer (perhaps like Miro's Constellations, indeed). A terrific piece: thoughtful, illuminating, wide-ranging and extremely well written. Congratulations! When retail price maintenance was abolished in 1971/2 many distributors and labels took the opportunity to clear their shelves of slow selling stock and Woolworths,of all people, bought thousands of these LPs and sold them in their stores for 5/-(25p)each. I was able to buy Karyobin along with Tony Oxley's RCA and CBS records and many Transatlantic/Prestige reissues together with several US LPs on obscure labels. The records were not even racked but were simply tipped in piles on to flat counters! Karyobin is still one of my favourite SME LPs.